Marissa Noyola should have been a high school dropout. Noyola was kicked out of a Chicago Charter School for poor attendance and then dropped out of another Chicago Public School because she was unable to afford transportation. Becoming a mother at age 15 and dealing with the death of her own father left her feeling hopeless. Things changed when Marissa found Ombudsman Chicago. Now, at age 19, Noyola has earned a CPS high school diploma and has been accepted to Roosevelt University where she will study to become a nursing assistant beginning this fall. Marissa found that Ombudsman Chicago’s flexible hours, convenient location and attentive staff were instrumental in helping her earn her diploma. Now back-on-track, Marissa serves as a role model for her two younger brothers who had also dropped out of school but are now attending Ombudsman. Marissa notes that she wants to share her story to show people that a teen mom can go to college and have a career. Chicago Public Schools partnered with Ombudsman Educational Services to open two Chicago-area dropout recovery Options School centers during the 2013 school year, offering teens a second chance at achieving academic success and building a bright future as they work toward earning a CPS diploma. 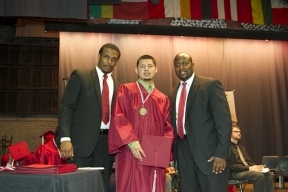 West Side native Jose Arroyo receives the Presidential Award for Educational Excellence from Assistant Principals Dr. Samuel Brown and Mr. Conrad Timber-Ausar during Ombudsman Chicago’s inaugural graduation ceremony held at Holy Trinity High School June 3. Arroyo, who had previously dropped out of high school, graduated first in his class of more than 30 students and will attend Malcom X College in the fall. Ombudsman Chicago is currently enrolling students for the fall semester. Visit www.ombudsmancps.com or call (312) 806-9022 for more information. 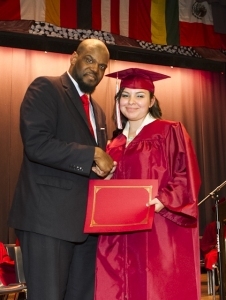 South Side native Marissa Noyola, 19, receives her high school diploma from Ombudsman Chicago principal Dr. Chaun Johnson. A single mother who had previously dropped out of school, Noyola found success at Ombudsman Chicago and will attend Roosevelt University in the fall to study to become a nursing assistant. Ombudsman Chicago is currently enrolling students for the fall semester.